It is time to compare some of the networking features of Hyper-V and VMware vSphere. Networking is one of the key elements of a Private Cloud. It is important to have a simple and scalable network infrastructure which is fast and secure. That’s why Microsoft invested into Hyper-V networking with creating features like built in NIC teaming, Network Virtualization and other security and offloading features. SR-IOV Support – Single-root I/O virtualization supports native IOV in existing single root complex PCI-E topologies. It requires support for new device capabilities to configure multiple virtualized configuration spaces. Dynamic Virtual Machine Queue (D-VMQ) – D-MVQ will dynamically span processing Virtual Machine Queue traffic across multiple CPUs. Port ACLs – isolation of network traffic for virtual network adapters and virtual ports. The vSphere Distributed Switch (required for PVLAN capability) is available only in the Enterprise Plus edition of vSphere 5.0 and thus far, seems to be replaceable (By Partners such as Cisco/IBM) rather than extensible. 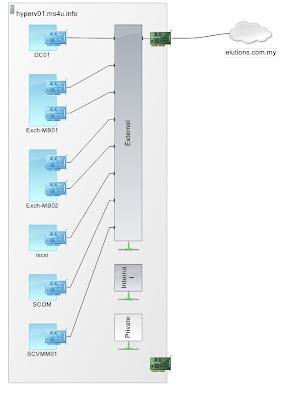 Port Monitoring and Mirroring at a granular level requires vSphere Distributed Switch, which is available in the Enterprise Plus edition of vSphere 5.0. Dynamic Virtual Machine Queue (DVMQ) is not supported by either XenServer or vSphere, which both support regular VMq (known as NetQueue on vSphere). No such restrictions are imposed when using SR-IOV, ensuring customers can combine the highest levels of performance with the flexibility they need for an agile infrastructure. Check out my Blog post Hyper-V 2012 – Hey I Just Met You And This Is Crazy for more information about the latest version of Hyper-V.
could you provide some sample pictures of how the virtual network designer looks like? Is it possible to design complex networks? Where would you personally see the limits/border of the virtual network design or when would you switch to changing the physical design of your cloud?